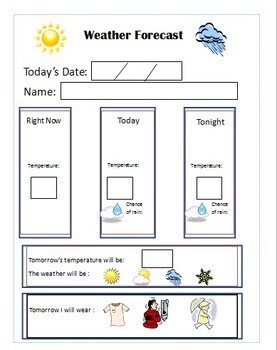 This is a worksheet that works well with weather.com because it is similar to the format on that website. It has sections for weather "right now", "today" and "tonight" along with "tomorrow's weather" and a section that asks what you should wear tomorrow. This is great for elementary as well as middle and high school special education. I use it for my students with moderate/severe autism. The visuals are great!